As an anime fan, it seems as if we’ve been waiting for Terraformars for a long time. The anime adaptation of the popular manga series was announced way back when by Manga Entertainment. Then their solicitation vanished from the release schedules to be replaced by one from Kazé Entertainment for whom Manga distribute in the UK. Kazé’s release date kept slipping back, and slipping back, until it vanished altogether. Now, you can see Kazé’s proposed Terraformars anime release on retail websites, with a release date to be determined, and it’s been that way for some three years at this point. I doubt the anime will ever be released at this point. And really, I think it’s a bullet dodged. The Terraformars manga and anime is politically incorrect, if I was being kind. I’m not kind. It’s racist on more than one level, and quite frankly I doubt I could watch the anime if it was presented to me in the form of a review copy. That in no way explains why I sought out and requested the live action Terra Formars feature film review disc from Arrow Video when they announced it last year. Well it’s as simple a reason as the fact that the movie is directed by the prolific and eclectic Takashi Miike, a director who can turn his hand to any genre and style and make a memorable movie. It may be good, bad or mediocre, but it will always be memorable. In the 21st Century, it became clear that overpopulation would doom the Earth, unless more breathing space was found. Eyes turned to Mars, and scientists devised a way to turn the arid, lifeless world into something more hospitable to mankind. They sent moss to convert the atmosphere into oxygen, and cockroaches to spread the moss around. In the year 2599, the world of Mars looks a lot more amenable to colonisation, but there is a problem. The BUGS-2 spaceship is therefore sent to Mars with the worst of the Earth, the criminals and terrorists to go and exterminate all the cockroaches. They’ve sent the garbage to clean the garbage. Only no one has told the crew that the cockroaches have mutated in the high radiation flux on Mars. They also haven’t been told that the operations ostensibly to acclimatise them to Mars were actually to splice insect DNA into their bodies, to give them cockroach killing superpowers when activated by a drug. But this may not be enough for Mars’ cockroaches, which are now humanoid in appearance, with physiques that put Mr Universe to shame. Terra Formars gets a 2.35:1 widescreen 1080p transfer on this disc, and it looks fine. The image is clear and sharp, and presented without any visible sign of compression, aliasing or banding. The detail levels are high, the action is choreographed well and looks great, and the special effects are of the typical mid-budget range that Japanese sci-fi movies usually afford. The make-up, costumes and in camera effects work comes across well, but some of the CGI is a little less than seamless. The filmmakers have found a neutral design for the cockroaches that doesn’t offend the sensibilities. You get a DTS-HD MA 5.1 Surround Japanese track with optional subtitles, although there is a bit of English dialogue in there, for which they’ve actually used a decent dialect coach. The action comes across well, with the fight sequences and thunderous space ship effects making a suitable impact, although I have to say that less than 24 hours on, I can’t remember a single note of the film’s score. I guess it’s one those music soundtracks that invisibly support the action and emotion. The retail release will come with a reversible sleeve, and the first run release will come with a booklet, neither of which I have seen. Arrow Video certainly aren’t stingy with the extras, although how useful they are will depend on your perspective. The Making Of is a feature length affair, taking you behind the scenes of the filming for a runtime of 87:57, presented in 1080i 60Hz. There are 4:46 of Outtakes. You get two Teaser Trailers and the Theatrical Trailer. Finally there is a Stills Gallery in slideshow format, although it does take its time going through the images, and you might be tempted to click through to speed the pace up. Terra Formars is not one of the good Takashi Miike films. On the bright side, its tale of sending an all Japanese crew to the red planet to deal with racially neutral, inoffensive looking humanoid cockroaches is designed to appeal to as wide an audience as possible, as opposed to the source material, which makes me wince in embarrassment to contemplate. Speaking of Red Planet, this film has a lot more in common with the Val Kilmer turkey, as opposed to Starship Troopers, which you might have thought of after reading the blurb. The film promises more than it delivers, as following a scene for which they must have paid Ridley Scott royalties, it begins by introducing us to an extensive cast, several reprobates on their way to Mars, conscripts for the cockroach clean-up. They are a broad spectrum of criminals, abrasive personalities liable to turn on each other before they even kill their first cockroach. But don’t bother learning their names or investing in their stories, as most of them are bug fodder, and once the action begins, the slaughter is almost relentless until the end credits. It isn’t long after landing that they find their first cockroach and are shocked to see that the cockroaches have been working out at a Martian gym. They are now fast and lethal, and have a tendency to swarm, to decapitate, crush, and dismember. If there is one thing really disappointing about the action in this film, it’s the repetitive and limited nature of the cockroach attacks on the crew. It’s pretty much the same routine each time, save for a couple of imaginative set pieces. To counter that, each of the crew has had a different bug’s DNA spliced in, so when they activate their powers, it all looks different on screen. The mission has been funded by a rich businessman on Earth, and he’s kept the nature of the mission secret from the crew, only revealing what is necessary and when, by calling up and taunting them. He is of course the true villain of the piece, the Weyland-Yutani of Terra Formars, although any comeuppance will have to wait for a potential sequel after the open end of this film. Yet I doubt a sequel will be likely. That’s even after the film tantalises with the unexplained sight of pyramids on Mars (it might make you want to catch that old Doctor Who serial though). 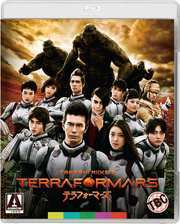 Terra Formars might have been an entertaining b-movie; certainly it has the action chops to back that up. Unfortunately it doesn’t quite exploit the humour of its premise sufficiently, there’s very little satire here, and the cockroaches lack the personality that might cause you to invest in the film. The real problem is that the pace of the film is hamstrung by the structure. Every time a character picks up an injection and activates his bug powers for the first time, the action freezes, and the narrator pops up to inform us of which species of bug he got spliced with, and what his special powers are. Worse, the film will also pause to offer flashbacks to the characters’ lives on Earth, to explain just how they got conscripted for the mission. As this usually happens just prior to, or even in the middle of a fight with the cockroaches, it feels like an emergency stop on the driving test pace of the film. Terra Formars just isn’t daft enough to sell its premise. Arrow Video do put together an extensive package of extra features for the film, but given the amount of green-screen work involved, it’s not the kind of making of that I can get interested in.